Part of a month-long series on terrible trips, great journeys and getting lost. Here are some geographic and economic realities, as any educated European of the late 1400s would have understood them: The European diet was monotonous and people were willing to pay good money for spices to liven up their meals. Those spices for the most part came from places to the east, lumped together in the European mind as “the Indies.” The easy and obvious routes there were blocked by Muslim states that were hostile to Christendom, and that made good money on the spice trade and weren’t interested in sharing the profits with Europeans. And since the world was round (yes, everyone knew even then that the world was round), it was theoretically possible to bypass the Muslim world and reach those places in the East by sailing west, although nobody knew exactly how far a voyage that would be. By 1494, a few more facts had come to light. Christopher Columbus, an Italian employed by the Spanish government, had sailed west and found some islands that he was convinced were the easternmost fringe of the Indies. A few years before that, the Portuguese had had a breakthrough in the other direction: Bartolomeu Dias, a Portuguese nobleman and captain, had finally proven that Africa did not extend south indefinitely, but could be circumnavigated, with the Indies presumably accessible to the north and east of the Cape of Good Hope. To head off potential conflict, the Pope (himself a Spaniard) negotiated a treaty between the two Iberian countries. He cut the world in half, roughly down the middle of the Atlantic, and, ignoring not only the people who lived in these far-off lands but also everyone else in Europe, gave the everything east of the line to Portugal and everything west of the line to Spain. A Malay, who we know as Enrique of Malacca but whose real name is unrecorded, would have his life defined by these European schemes. He is, it turns out, the closest thing there is to a hero in the story of Ferdinand Magellan’s horribly botched attempt to circumnavigate the world. Everyone knows what the Spanish did after 1492: they conquered the islands of the Caribbean, then the mainland of Meso- and South America, killing thousands through war and slavery and millions with diseases, and slowly realizing that their new empire wasn’t in the Indies at all, but in a whole new continent nobody in the Old World had known existed. The Portuguese, staying on their eastern side of the dividing line, were more focused. Whereas even the strongest American states were no match technologically or organizationally for the Spanish, the Portuguese sailed into the Indian Ocean and found adversaries over whom they had just a bit of an edge. So they conquered where they could, intimidated when couldn’t, and sometimes even made friends, ending up with an odd little empire of isolated forts and cities protected by a powerful Indian Ocean-based navy. The goal was to seize control of the spice trade from the Muslim merchants who had monopolized it. In 1511, they captured Malacca, a city on the Malay peninsula that controlled ship traffic between modern-day Indonesia (home of all those delicious, expensive spices) and the West. “Cairo and Mecca would be entirely ruined,” gloated the Portuguese viceroy in advance of the raid, and so it was; Egypt’s spice monopoly collapsed and the country was conquered by the Turks just a few years later. And by this my present will and testament, I declare and ordain as free and quit of every obligation of captivity, subjection, and slavery, my captured slave Enrique, mulatto, native of the city of Malacca, of the age of twenty-six years more or less, that from the day of my death thenceforward for ever the said Enrique may be free and manumitted, and quit, exempt, and relieved of every obligation of slavery and subjection, that he may act as he desires and thinks fit; and I desire that of my estate there may be given to the said Enrique the sum of ten thousand maravedis in money for his support; and this manumission I grant because he is a Christian, and that he may pray to God for my soul. Other sources call Enrique a native of Sumatra, the island just across the straits from Malacca, and (as we’ll see) he was fluent in the language of the islands, so he almost certainly wasn’t a “mulatto” in the sense we’d expect (i.e., of mixed African and European heritage), but rather a Malay, a rather exotic ethnicity to contemporary Europeans. We don’t know whether his conversion was genuine or compelled or an attempt to curry favor with his captors. We don’t know whether he ever had any intention of praying for the soul of the man who kidnapped him and took him thousands of miles away from the world he knew. Magellan was something of a crank who fell out with his commanders. He returned to Europe, bringing Enrique home with him, fought in Portugal’s wars in Morocco, got a leg wound, was accused of illegally trading with the enemy, left the army under a cloud. He studied navigation charts and became more and more convinced that the islands in Indonesia that were the source of the most valuable spices could be reached by sailing west from Europe and around the Americas. This was obviously of little interest to Portugal, which was enjoying a pretty good spice trade return on its strategic conquest investment at this point, but it piqued the interest of the Spanish. Spain’s new empire in the Caribbean wasn’t turning out to be as profitable as had been hoped; the conquest of Mexico was just getting underway and Peru wouldn’t be seized for another decade, so American gold and silver hadn’t started flowing back to Europe yet. Sailing to the Spice Islands in the Spanish direction (west) would avoid conflict with the Portuguese navy, and Magellan dangled the possibility that the islands were really on the Spanish side of the dividing line (an easy prospect to dangle, given how bad everyone was at determining latitude at this point). King Charles of Spain gave him five ships and a crew of 232, and the rights to a cut of the presumably lucrative spice trade he’d establish. 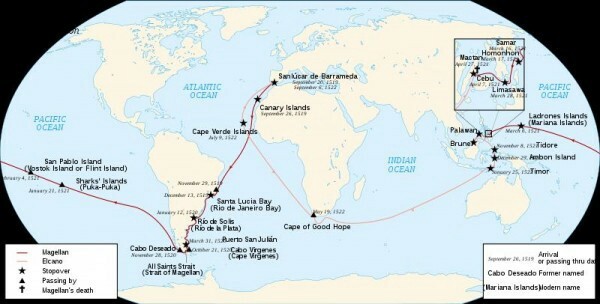 The expedition left Spain on September 20, 1519. And Enrique went on this trip too — he would be invaluable as an interpreter in the region, obviously, but he also had gone everywhere else Magellan did since his capture, so there was no reason for him not to also go on this voyage. The ships sighted South America on the 6th of December, after which virtually everything that happened to expedition was terrible. They had to stay one step ahead of the Portuguese, who were not keen on having Spain slip in on their spice trade via the back door — in an expedition led by a Portuguese to boot. In March, they established a little settlement in Patagonia; days later, two of the ship’s captains attempted a mutiny, which fizzled out when their crews refused to go along. At least one of the captains was executed, his impaled body left to rot in the abandoned town. The ships spent months inching their way down the coast; one was wrecked in a storm. In late October, the four remaining ships found what’s today named the Straight of Magellan; Magellan himself more modestly named it “All Saints’ Channel,” because he was sailing through it on November 1. One more of the ships simply turned around and sailed for home at this point, taking most of the expedition’s food with it. This left behind only three to enter the Pacific, so named by Magellan because of its eerie stillness. They put South America behind them on November 28, 1520. The South Pacific between the Chilean coast and French Polynesia is one of the longest stretches of open ocean in the world, and Magellan, by sailing diagonally northwest, managed to spend a lot of time in it. By the time they finally got far enough west to a part of the sea where there were islands, they had gotten too far north to actually run into any of them. They spotted a couple of tiny islets — one in January, one in February — but didn’t land on them, and for the most part managed to swing far to the north of Polynesia (then unknown to Europeans) and the entire Spice Island chain that had been Magellan’s target in the first place. 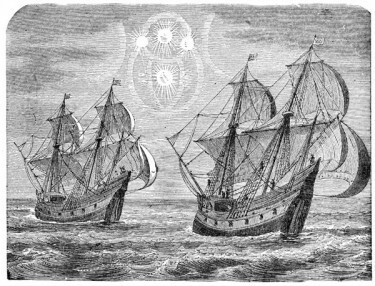 On March 6, 1521, after what was (for the time) a ridiculous stint of three months at sea without taking on provisions, the ships finally blundered into the Marianas Islands; the half-starved crew encountered Chamorro locals whose different understanding of property prompted Magellan to name the archipelago the “Islands of Thieves.” The Spanish had big guns, though, so they still had the better of the encounter. Resupplied with food, and aware now that they had gone too far north, they turned southward and by March 17 had reached what are today the Philippines. Here’s were Enrique re-enters our story. This was a part of the world where they spoke his language, or something close to it, and so he fulfilled his duties as ship’s interpreter. Antonio Pigafetta, an Italian crewman who wrote the most detailed description of the expedition, refers to him by name only once, as “Henrich,” but references to him as the interpreter dot his accounts of the next few weeks. And these weeks were among the expedition’s most hopeful. They arrived on the island of Cebu on April 7. Humabon, the local leader, agreed to be baptized as a Christian, then quickly requested that his new allies help him out with an ongoing dispute he was having with Lapu Lapu, the ruler of the nearby island of Mactan. Magellan agreed, sailed to the island, launched an ill-advised attack on Lapu Lapu’s army, and was killed on April 27. His body was never recovered. The expedition limped back to Cebu. Humabon had watched this botched attack from a distance, and apparently decided that maybe his new friends weren’t as impressive as all that. Meanwhile, John Serrano, the new leader of the expedition, told Enrique that he would remain a slave, despite the promises in Magellan’s will, because the expedition still needed a translator. This was not news that he was particularly keen to hear. And so Enrique made the only decision on his own accord that we have recorded in our sources: he decided to get rid of his tormentors. Scarcely had they spoken those words when we heard loud cries and lamentations. We immediately weighed anchor and discharging many mortars into the houses, drew in nearer to the shore. When thus discharging [our pieces], we saw John Seranno in his shirt bound and wounded, crying to us not to fire any more, for the natives would kill him. We asked him whether all the others and the interpreter were dead. He said they were all dead except the interpreter. He begged us earnestly to redeem him with some of the merchandise; but Johan Carvaio, his boon companion, [and others] would not allow the boat to go ashore so that they might remain masters of the ship. But although Johan Serrano weeping asked us not to set sail so quickly, for they would kill him, and said that he prayed God to ask the soul of Johan Carvaio, his comrade, in the day of judgment, we immediately departed. I do not know whether he is dead or alive. And that is how Enrique freed himself from slavery and got almost all the way back to where he had started, a decade after he left, traveling west all the way, and that is the last we ever hear about him. The Philippines are still several hundred miles short of Malaysia, but there was commerce all through that part of the world, and it seems sad to think that, having come so far, he didn’t eventually make it home, so I (and many others) assume that he did, thus becoming the first person to circumnavigate the earth. 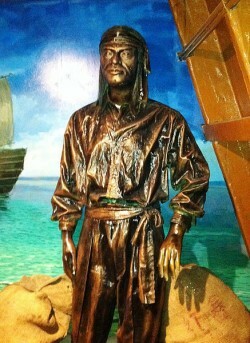 He’s now something of a celebrity in Malaysia: this photo of his statue — entirely fanciful, as no contemporary portrait of him exists — is in the Maritime Museum of Malacca. After abandoning their commander to his death on the Cebu beach, the sailors of the Spanish expedition headed west. They had suffered so many casualties that they didn’t have enough crew left to man their three remaining ships, so they burned one of them. After wandering through the Indonesia for a while, they really did manage to find the Spice Islands, in November, and successfully traded for some cloves and cinnamon. But the Trinidad, the larger of the two ships, had sprung a leak, and needed to be overhauled. The other ship, the Victoria, sailed west for home on December 21; a few weeks later the Trinidad made an abortive attempt to turn around and go back via the Pacific, but was captured by the Portuguese, who were still angry that the Spanish were trying to get a piece of their newfound spice monopoly. The crew was imprisoned, and only five lived long enough to return to Europe, years later. The Victoria rounded the southern tip of Africa on May 6. On July 9, it reached the Cape Verde islands in the Atlantic. By this time, 20 crewmen had starved to death, and now another 13 were left behind in Cape Verde. On September 6, 1522, just short of three years after it had left, the Victoria arrived in Spain with 19 crewmen and 26 tons of spices. The crew were not paid the full wages they had been promised, which helped the expedition make a modest profit. Josh Fruhlinger never goes anywhere without printing out stuff from Google Maps first. Follow him on Tumblr or Twitter. Map courtesy of Wikipedia; photo of Enrique statue by abdullatif hamidin.